Back in July I had a plan for this cabinet. And now in February it is finally finished! It wasn't that I didn't have the time to do this project, frankly I was afraid to do it! What if I didn't like it? What if I ruined it? These cabinets are built in so there is no putting the ruined project out to the curb. I can hardly make them look worse! 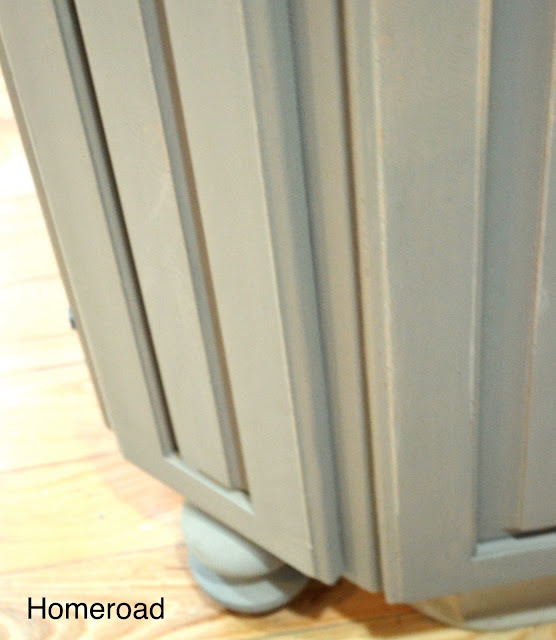 After months of sitting here staring at this cabinet and picturing it in the color I wanted, I took the plunge! I rolled out butcher paper on my kitchen floor, took off all the cabinet doors, and started painting. I used Annie Sloan in Paris Grey. 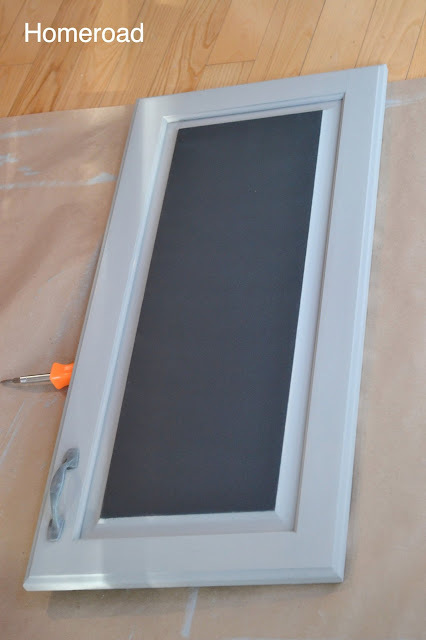 I painted the center panel on one door with chalkboard paint for a message center. I am going to line the inside of this door with cork for a hidden bulletin board. I added bun feet that were left over from a headboard project. And the cabinet is finally finished! No need to kick this to the curb. I'm thrilled with the results, I should have started this project a long time ago! And then I did... see the DIY on the rest of the kitchen! Susan! Great choice. Love the color you chose and the chalkboard looks perfect!!!!! Beautiful! It looks great, Susan! I do know that feeling of trepidation, especially when it is something permanent as opposed to a piece of furniture you picked up at a yard sale. Love the color and the chalkboard you did on the one door. 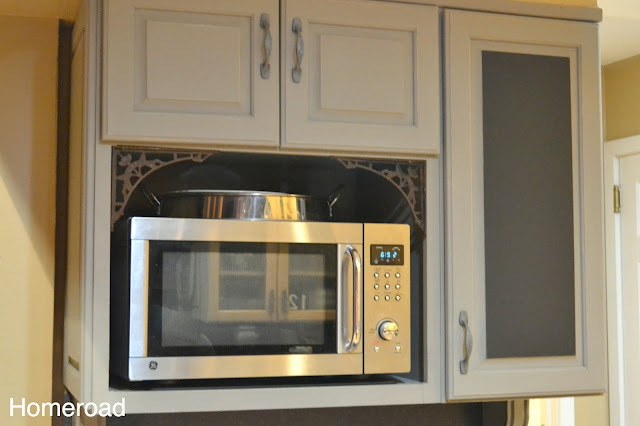 Love the color that you painted the cabinets...it turned out great!! Also love that you did one door in chalkboard paint!! 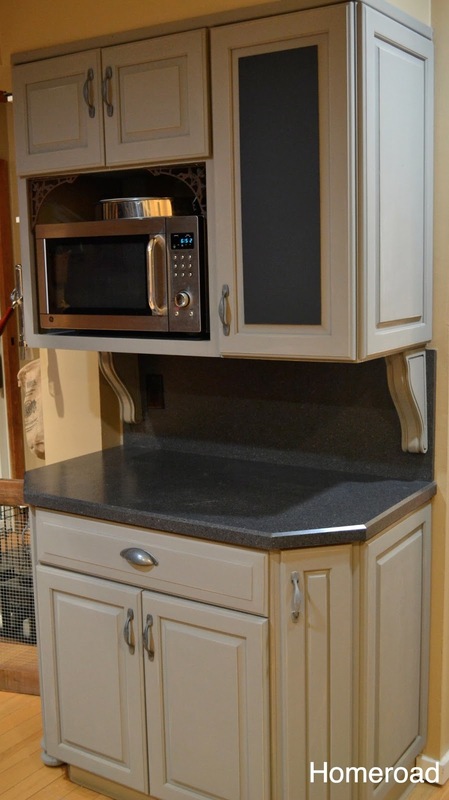 So you don't want to tackle all the cabinets yourself? I am actually surprised by that! Will you do them the Paris gray? One question, if you don't mind. Ok, two. Did you use a brush, inside and out? Did you use a roller for any if it, then brush over while wet? I know how you are feeling... just do it, it comes out wonderful! I used a brush on the indents and a small roller on the flat parts, there are no brush strokes. If you get any you can lightly sand them. I can't wait to do the rest of mine! Good luck and send pics! Painting kitchen cabinets is a long drawn out affair. I would hate to think that someone would have to come to my house so many times, so often. I'm glad I did mine. It seemed like it took forever, but they still make me smile! 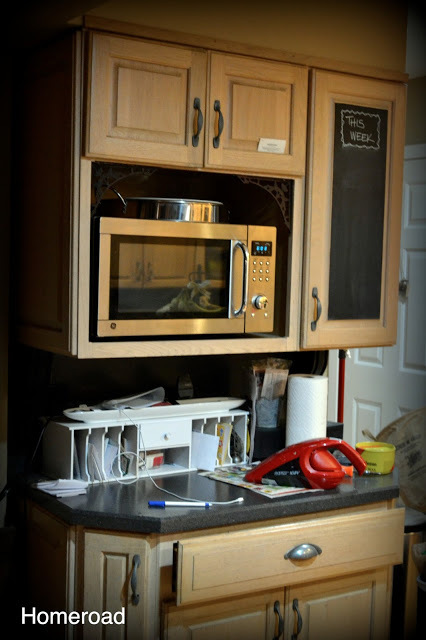 LOVE your cabinet, with the chalkboard. You did a great job Susan! That looks fantastic!! Great job and I love the colours together with the countertop. Nice choice!! What a beautiful transformation. I love the color and the chalkboard door you added. I would love to paint my kitchen cabinets, but the job is just too overwhelming...I'd do nothing else for at least a month, lol. Thank you for the inspiration. It looks fantastic! I love all your special touches, like the corbels and bun feet, too! Thanks for stopping by and now I can see your cabinet clearer then on the phone. Looks great! I painted just my island - black distressed and the crown trim on the top of the cabinets. I think I'd like them all black - except I want obscure glass in the uppers. But I too have not tackled the rest because I'm daunted my the size of the task. 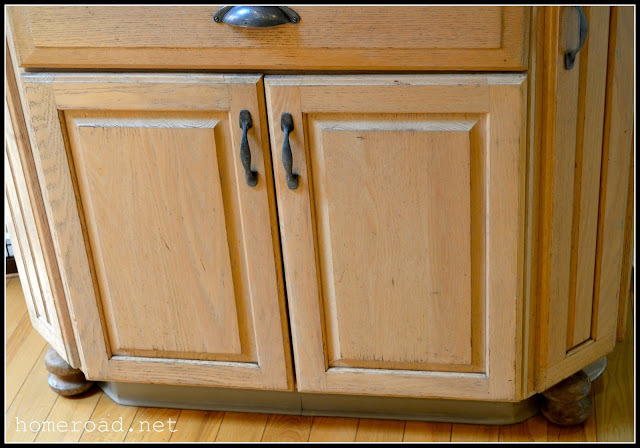 I am thinking of painting my kitchen cabinets and trimming them up with molding and "feet" to look like two different pieces of furniture. How do you find the right "feet" for the base? my cupboards were built in and are not a standard height. Do you have to special order? What did you paint the knobs and hinges with? Mine are Brass colored and would like to change the look. Thanks for this post! !..It looks great! I have just started to paint my kitchen cabinets with ASCP. I am getting brush strokes? I see where you used a roller. I had heard that a roller wasted to much of the paint?? But I am willing to use a roller if it helps. Your thoughts on this please..